Situated in the beating heart of Shoreditch, the Smoking Goat is the second restaurant started by Brian Hannon and his business partners Ben Chapman and head chef Ali Borer. Their company Super 8 Restaurants now owns three restaurants; Smoking Goat, which shares a building with Brat, a converted pub in Shoreditch. Their first, Kiln, is based in Soho. Smoking Goat has a menu inspired by the late-night canteens of Bangkok, while Brat combines Welsh and Basque cuisines. Kiln offers a Thai-based grill menu. The restaurants use wood charcoal to deliver an authentically smokey flavour with their meals. Quality is vitally important. “We are very particular about the suppliers we work with,” Brian explains. “Fresh seafood is delivered daily from Cornwall, our farmer Sean grows all our herbs and vegetables, and we have a butchery in the basement at Shoreditch that prepares all the meat used in all of our restaurants”. With such high standards for the menu, the presentation needs to reach the same high standards. 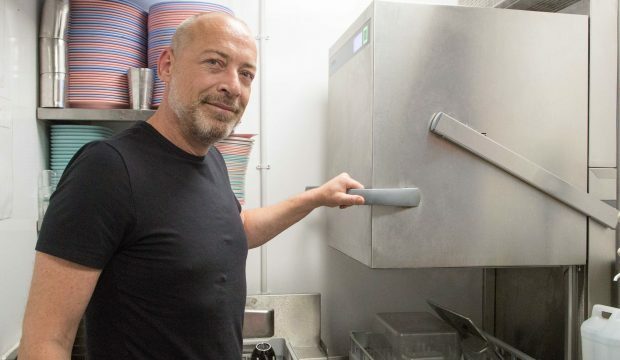 “Obviously we want the plates and glasses to be perfectly clean every time, so we needed to make sure we had the right equipment”. The equipment selected for Smoking Goat and Brat was based on each restaurant’s requirements and the amount of available space. “There’s more space available upstairs, so Brat has a large passthrough warewasher we can use to clean all the crockery as well as gastronorm pans. But downstairs space is tighter, so Smoking Goat’s passthrough is smaller and just used for crockery. But it’s more than capable of keeping up with the demand we face at peak times,” says Brian. Besides perfect crockery, clean glassware is vital. The glasswashers in use across the two restaurants are undercounter models with integrated Reverse Osmosis units that filter minerals and other particulates, helping to guarantee perfect results every time. The final fit was Winterhalter’s commitment to sustainability. “Obviously this is a vital part of any modern restaurant worth its salt,” says Brian. “We’re constantly looking for ways to reduce our consumption, of energy, of water, everything. You absolutely have to consider your environmental impact, so partnering with another company that feels the same means we’re both always trying to work out new ways to reduce our impact on the planet.